Explore the Moscow Kremlin and Red Square with an expert guide on a 4-hour private tour of the UNESCO World Heritage Site. Learn the stories behind the remarkable complex of landmarks, from the Kremlin’s founding as a 12th-century fortress to the modern-day Presidential Regiment. 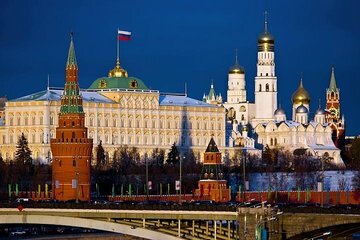 This Moscow Kremlin and Red Square tour includes all entrance fees, as well as pickup and drop-off at your Moscow accommodations. Meet a driver at your hotel for 10am departure, then transfer to the heart of Moscow in a climate-controlled vehicle. Upon arrival at the Moscow Kremlin and Red Square, you’ll start at the oldest square in the city, Cathedral Square, home to three landmark cathedrals and fascinating medieval architecture. During the months of April through October, it’s possible to watch the changing of the guard here, as the Horse Guard and Foot Guard of the Presidential Regiment perform elaborate formal drills. Continue to the Church of the Deposition of the Robe, once the private chapel of the Patriarch of Moscow, then visit Ivan the Great’s Bell Tower, the tallest structure in the Moscow Kremlin. As you walk, the guide will share insights into Moscow history and culture, with plenty of time to ask questions and discuss the things that interest you. This is the oldest part of the city and it's still the official residence of the President of the Russian Federation, so it's the perfect place to learn about Russia's past, and modern-day life. Following your time at the Moscow Kremlin and Red Square, make the return trip to your hotel, where this 4-hour tour concludes. very disappointed. This was an extremely expensive 4 hour tour in celebration of my birthday so our expectations were high. Initially we were advised that our tour would commence at 10am from our first hotel. I advised viator that we would be moving to a hotel closer to the sites so THEY changed the start time to 11am. When we arrived at the hotel at 1045am our guide was there and advised us that the tour commenced at 10am and we would have to rush to get to the Kremlin before our entry tickets expired. We almost ran to the Kremlin- so the preliminary discussions never really took place regarding the history. Once inside it was apparent that Svetlana's knowledge of the site and Russian history was excellent - but we were flustered and busting for a loo on the rush there... so it took a while to get back into the mood of the amazing sites before us. The tour then completed at the 3 hour mark with our guide advising us of the location of things in Red Square and the timing of the changing of the guard. There was no need for the climate controlled vehicle promised in the brochure and obviously costed to us. Overall - should have just bought Kremlin entry tickets 10 and read the Lonely Planet Guide - would have saved over 600!! Muito bom. Guia comprometida e com um perfeito espanhol. Explicou com riqueza de detalhes, paciência d cordialidade. Lugar lindo.